You might be surprised to learn that vitamin D is one of the important vitamins for the human body, but many of us aren’t getting enough. Its primary job is to store the right amount of calcium and phosphorous in your blood to keep your bones strong. The best source for vitamin D? The sun! Studies show that if your skin is exposed to 10 to 15 minutes of the summer sun, then you are probably getting enough. Keep in mind; however, when you put on sunscreen, it will prevent your skin from soaking up the rays so there truly is a balancing act. We know, we know, you can’t just throw a party on a whim – but the truth is you can! Rather than spending weeks planning, preparing and cleaning every surface of your home, consider inviting a few close friends over for a get-together. Encourage everyone to bring a dish to pass and just enjoy the company. We bet you won’t miss the usual summer party stress. Did you know that June 21 is also International Day of Yoga? We can’t think of a better way to honor the lasting sun than with a few sun salutations. To celebrate the summer solstice, The Times Square Alliance recently introduced a counterpart to New Year’s Eve (the winter solstice,) by creating “Mind Over Madness Yoga.” Today, thousands of yogis from all over the world will travel to New York City to participate. Of course, we’re not in NYC, but everyone can still participate through webcast. There may not be anything different about tonight’s sunset versus any other night of the year, but we think tonight would be the perfect evening to watch the beautiful sunset and reflect on all of life’s blessings. It’s not every day that we have the chance to enjoy over 15 hours of sunlight. How will you celebrate the longest day of the year? Happy Summer Solstice from Lions Pride! We think Henry Van Dyke was right on the money when he said, “The first day of spring is one thing, and the first spring day is another. The difference between them is sometimes as great as a month. 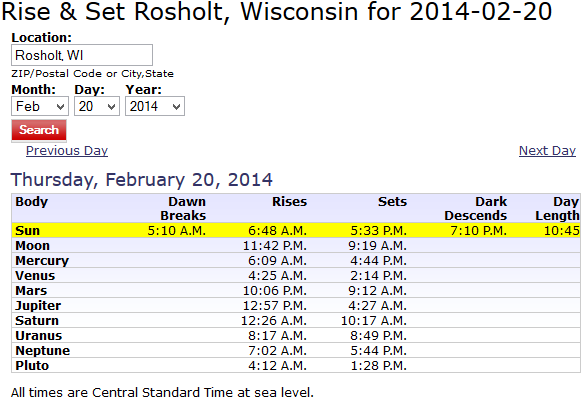 We have gained over an hour and fifteen minutes of daylight in the past month. By April 20, we will reach over thirteen hours of daylight. The high temperature for Rosholt today is 39°F. This may seem far from warm, but it is almost 90 degrees warmer than it was during the coldest parts of January. We even wrote a blog post to prove how it cold was during that time. Although it doesn’t quite feel like spring. Birds are already making their way home. You may have already heard them chirping outside your window. It’s time to start thinking about gardening. You may not be able to plant anything in the ground just yet, but you can always start plants indoors. And finally, our favorite part of this time of year is knowing in a few short months, Lions Camp will be again buzzing with the sound of happy campers! Remember, the worst is over and we did it! How do you plan on getting through the final stretch of winter?